If you wish to receive information about new samples in the gallery, subscribe please for our news announcement letter. Sign your e-mail please and push the "Subscribe" button. - OnlineArt Gallery. We are happy to welcome you to our web-gallery. We offer for your attention the best samples of contemporary Russian art: oil paintings, graphic arts, sculptures, gobelins, batic etc. Our site is designed for collectors, art-dealers, corporations and museums collections keepers, designers and interior designers, and real amateurs of Russian Art from all over the world. You may buy the chosen samples or fill in the form of your exclusive order. 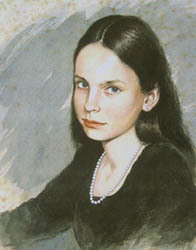 Well-known russian painters can make portraits or any picture you wish in accordance with your description. 1. Portraits of any complexity to order. Well-known artists contributing to OnlineArt Gallery will make your portrait, as well as portraits of your friends and members of your family, for you. You can order a miniature portrait, a breast portrait, a full-length portrait, a portrait with highly finished background details, a portrait of yourself in the costume of an 18th-century nobleman, a portrait of your favourite actor or writer, family portrait, etc. It is hard to describe all possible variants. Making a classical portrait is a labour-consuming process, with a technique that takes a lot of time. First the artist sketches out the background and major details of the future portrait, and only after that will he proceed with careful finish of details. Normally, a finished oil portrait would have from ten to fifteen paint layers, and it means that the portraitist may continue work only after having each subsequent layer completely dried. It is for this reason that a portrait usually takes two to three months to be completed. Today, there is no need for you to visit the artist's studio and spend precious long hours in sitting for the portrait. You can comfortably order a portrait from your home. It is only enough to send us a few photographs of your own or a video cassette with a record of the events of your life - and have your portrait made and delivered to a place you name. In our gallery of portraits made to order, you may see photographs of earlier portraits, which will facilitate your own choice of the type of a portrait and the portrait-painter. Feel free to ask our Gallery managers any kind of questions by e-mail about ordering a portrait. The portraits of such celebrated people as writer Yuz Aleshkovsky, Josef Brodskij's portrait for the collection of the Brodskij Foundation (USA), the portraits of ballet stars of world renown Mikhail Barishnikov and Alexander Filippov, actors Michael York, Meryl Streep and many others were made by the artists working to the orders of OnlineArt Gallery. 2. Paintings - birthday gifts to order. The "center-piece" of such a painting is a thin slab of polished stone corresponding to your birthstone. The art of engraving on stone is rooted deep in the Ural culture, but the idea to combine the traditional technique of oil painting with thin sections of natural Ural stone is a first. The rough stone is sliced into thin fragments that are carefully polished and affixed onto the canvas in a special way. Here the stone is the tuning fork. The unique pattern of the stone, unsullied by man, becomes the epicentre of the forthcoming painting. At the junction of canvas, paint and stone an unexpected phenomenon of art is born. The artists neither argue with nature nor copy it - they accompany it, creating at the same time their very own and unusual work. Nature becomes a co-author, being a competent participant in the creative process. The stone merges and visually becomes one with the picture, the colour design accentuates and sets off the stone's natural beauty, and its presence on the canvas makes the work absolutely unique, because nature produces no replicas. The distinction of the genre is the possibility to find a work making an indubitable match to your individuality: a favourite painting combined with a birthstone establishes long-term relations of specific quality between the picture and its owner. It is for this reason that a work of this kind makes an ideal gift - very personal and absolutely unique. We will be happy to advise you on all aspects of ordering oil paintings with natural stones. All you have to do is write us a letter by e-mail , and a manager of our Gallery will immediately get in touch with you. We also invite you to visit our gallery of paintings made with the use of natural stones. 3. Landscapes from photographs to order. 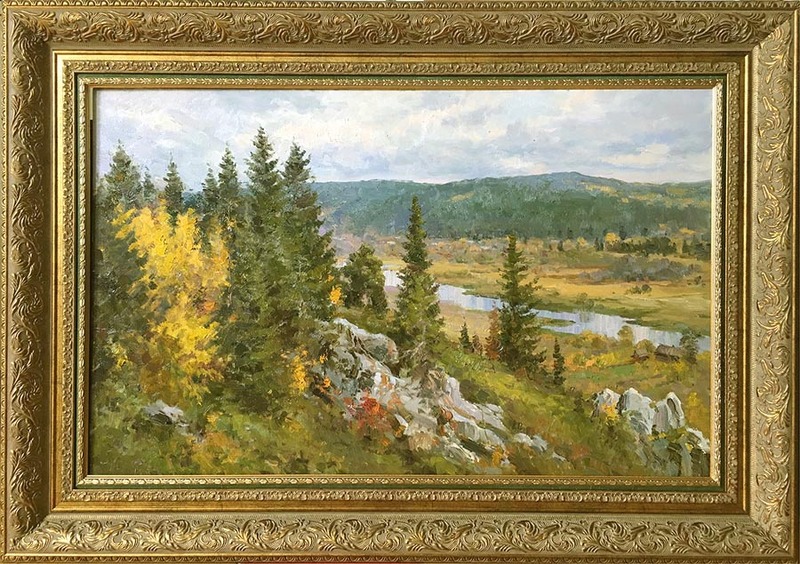 Our Art Gallery traditionally displays online multiple landscapes fulfilled by celebrated landscape painters of Ekaterinburg, the Urals region and Russia, but if you have failed to find a landscape to your liking, there is an opportunity to order one from a photograph. With this you will become an owner of a painting ideally blending with your interior in its subject and size. We are glad to offer to your attention the photographs of the most beautiful places of Russia (forest and mountain landscapes, lakes, rivers, city landscapes, photographic images of insects on flowers, etc.). Upon your request, the subject you chose will be carried over to canvas or paper in minutest detail. Paintings made after your own photographs are also possible. 4. Fashionable women's dresses made to custom from hand-painted cloth. The OnlineArt Gallery offers sculpture fountains made to custom after an original design, with regard for customer's wishes and the architectural and landscape features. In the fountains manufacture, different kinds of materials may be used, such as: bronze, natural stone, ceramics, metal, concrete, plastic, glass, etc. Sculpture fountains will give you interior an inimitable individual style, making the spot near the fountain more respectable and attractive. The sculpture will preserve your feeling of a fountain in the off-season, when water is turned off. On an order of your corporation, we will be glad to put together a corporate collection of paintings perfectly matching in the interior of your office and turning your office into a picture-gallery. A collection of paintings so selected will not just bring an atmosphere of comfort and perfection to your office, but will also become a good way of capitals investment. In the estimate of the leading art critics in Russian, prices for objects of modern Russian art are going up: on the average, twenty to thirty percent annually, and even higher - for the works of some authors. For this reason, purchase of paintings may be regarded as one of the most reliable investments. The OnlineArt Gallery offers services on organizing art exhibitions. If you want to host an art exhibition in your office, feel free to call us, and we will save you the trouble of organizing such an exhibition at your place. On this page we have briefly listed the main activities of our Art Gallery. We will be happy to answer all your questions. Write to our e-mail address: gallery@sky.ru. Sale of paintings is only one of the directions of our activities. We also set ourselves the task of familiarizing the art lovers with the art of the celebrated and world-known Russian artists, and with the interesting works of beginners - which will definitely help the latter in making their professional careers. For this reason we reserve ourselves the right to keep on our web-site the photographs of some paintings, which, though already sold, will still be available for viewing in our online Art Gallery. We hope that the exhibits displayed in the Gallery will comfort your heart and soul. We wish you pleasant impressions while browsing our gallery and good purchases.